If you are trying to write Historical Fiction (or, I suppose, proper history) you can’t beat a little hands-on experience. So when I heard about the Chalk Valley History Festival, I had to go. With re-enactors from many different periods and talks by famous historians – it seemed to be essential research. I booked a talk by Tom Holland on “Athelstan and the Battle for Britain: The Making of Britain Part 2”. This talk was at 5 o’clock on Sunday 3rd July and the price included entrance to the whole event for that day. On the programme was the Battle of Ethandun, when King Alfred defeated Guthrum in 878. Never mind anything else, that was enough for me! 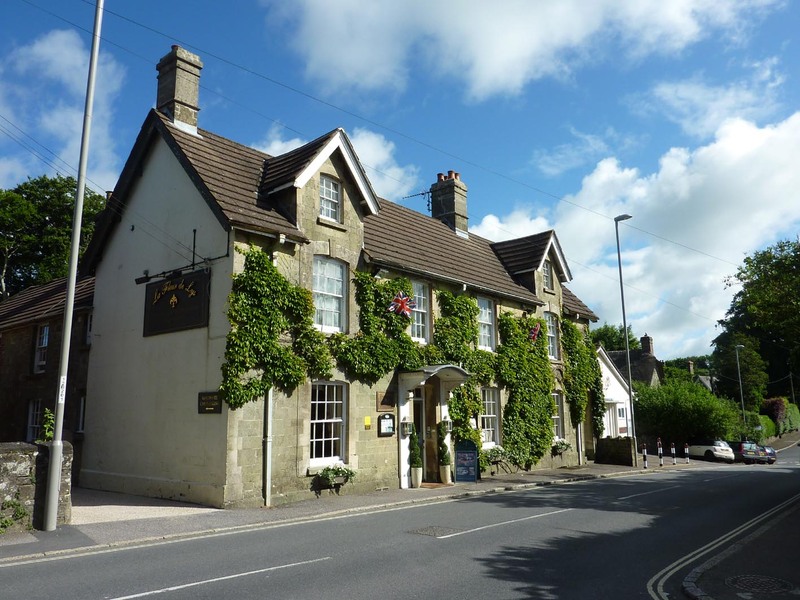 We decided to make a weekend of it and booked a hotel in Shaftesbury for three nights (Friday to Monday). It was such a busy visit, I have divided it into two posts. Sunday at he Festival will be in Part 2. Every adventure starts with a journey and as we planned our route, straight down the Fosse Way to Cirencester, then head south. I noticed that we would be passing close to Malmesbury. 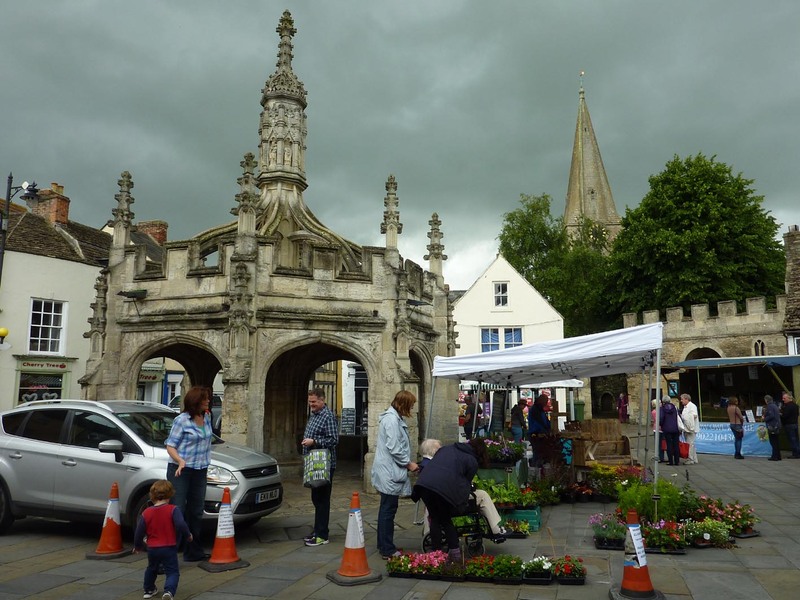 What is so special about Malmesbury? Well, since we had tickets for a talk about Athelstan, we had to visit the site of his grave. Athelstan was the grandson of Alfred the Great. He was King of the Anglo-Saxons from 924 to 927 and King of the English from 927 to 939. 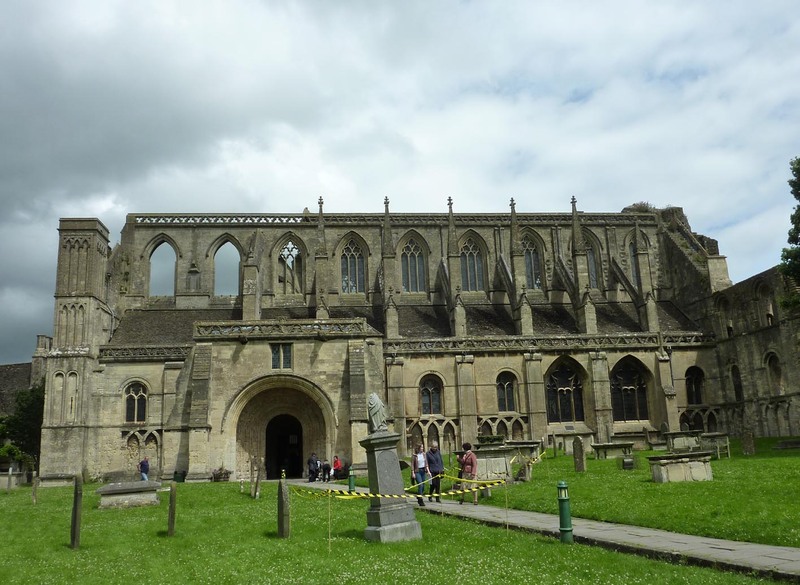 He favoured the Abbey at Malmesbury and had buried relatives there who died at the Battle of Brunanburh (937). 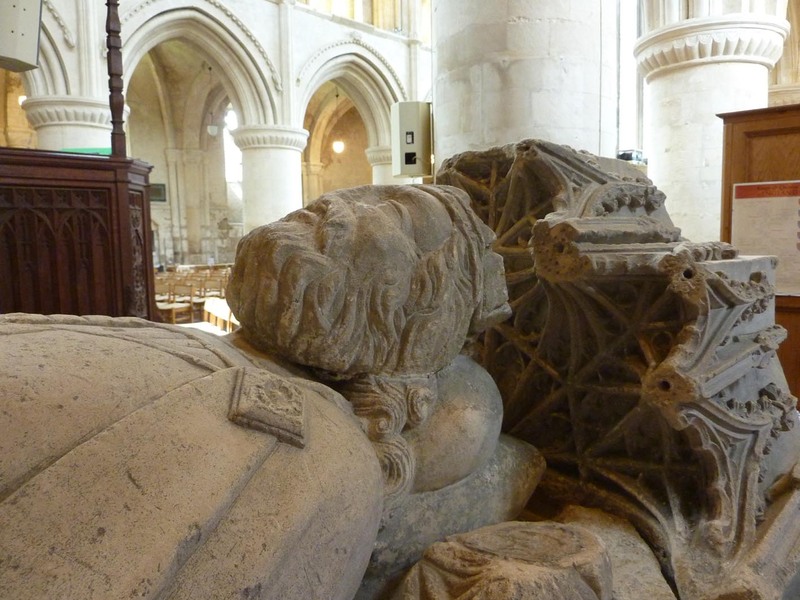 The site of his grave is lost but he is commemorated by an empty fifteenth-century tomb. The Abbey is interesting in its own right, half ruin and half parish church. 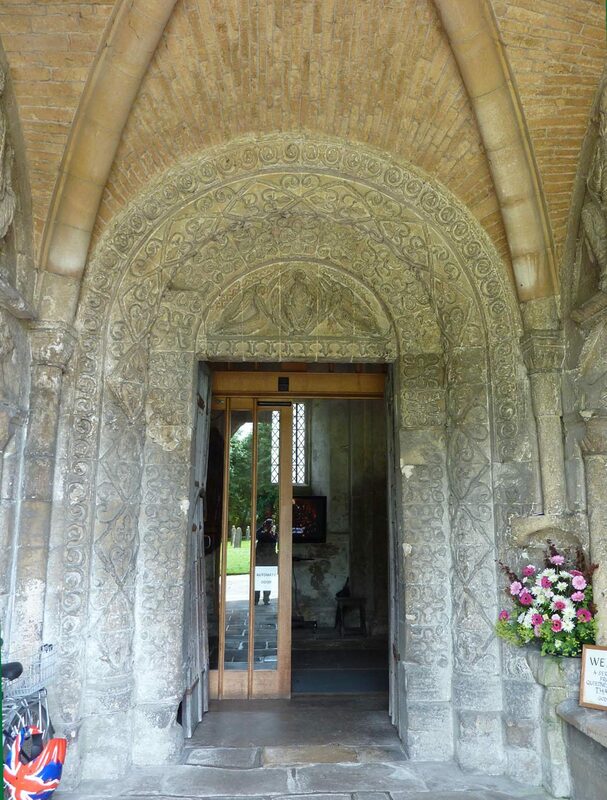 Very light inside and with some beautiful Norman carving. Aldhelm, the scholar and first Abbot (died 709). In the early 11th century, the monk Eilmer built wings and tried to fly from a tower. He flew over 200 yards (200 m) before landing, breaking both legs. He was forbidden to try again but calculated that he would have succeeded if he had included a tail! Can you tell we went round the town museum as well? It’s called the Athelstan Museum. It also has displays of the later history of the town. 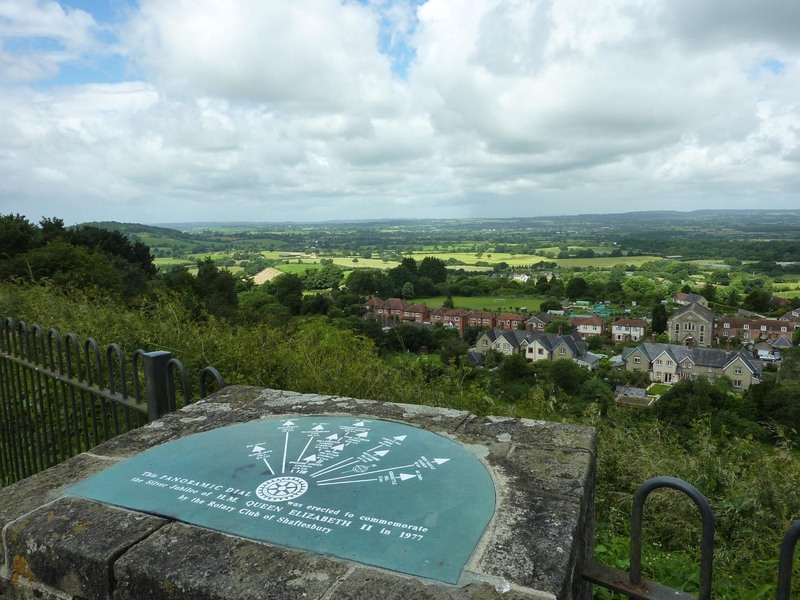 We continued our trip and arrived in Shaftesbury to time to have a short walk around the town to see the sights. 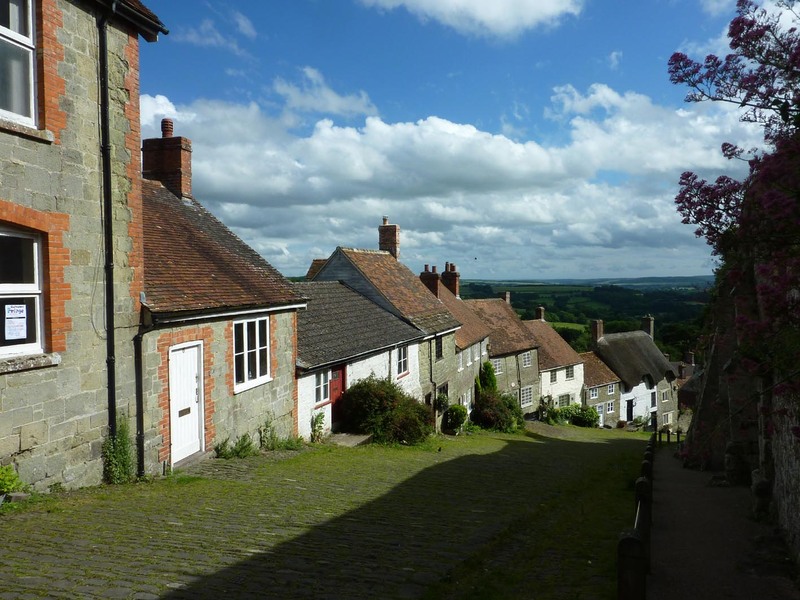 We didn’t know when we booked, but there were a number of events on in the town that weekend: The Shaftesbury Fringe and Gold Hill Fair. When we stood at the top of Gold Hill that afternoon, music could be heard from nearby. It was The Wandering Winds on their World Tour of Dorset. We didn’t wait long enough for Dvorak’s New World Symphony, that would be too much of a cliché, but it added to the atmosphere. We were booked into La Fleur de Lys (who let those Normans in?) which is described as a restaurant with rooms, so we enjoyed a delicious meal and a comfortable night, before waking to a new day. We like to get to know a place where we stay and we had found a walk online, so it was walking boots on. 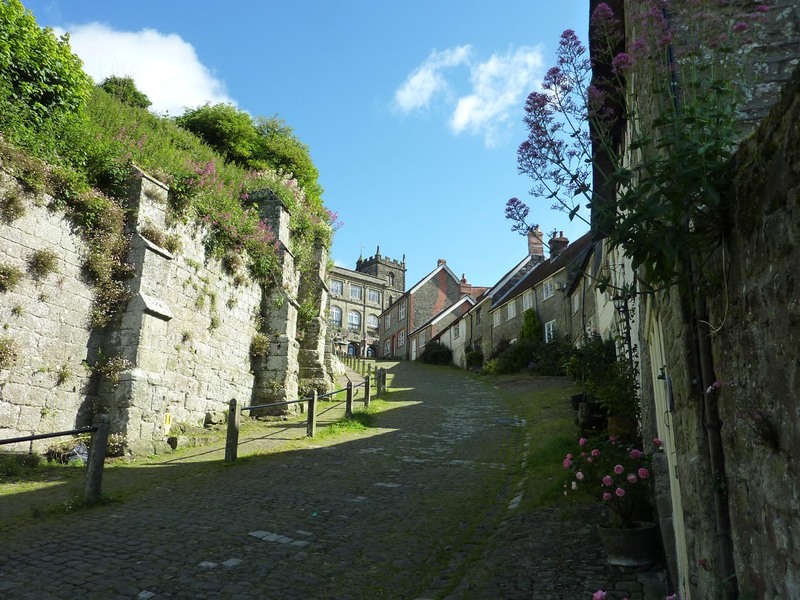 It started by going down Gold Hill, through lanes and across fields to the south of the town, returning to the town via Stoney Path (a narrower but no less steep alternative to Gold Hill) and finishing at Castle Hill View. 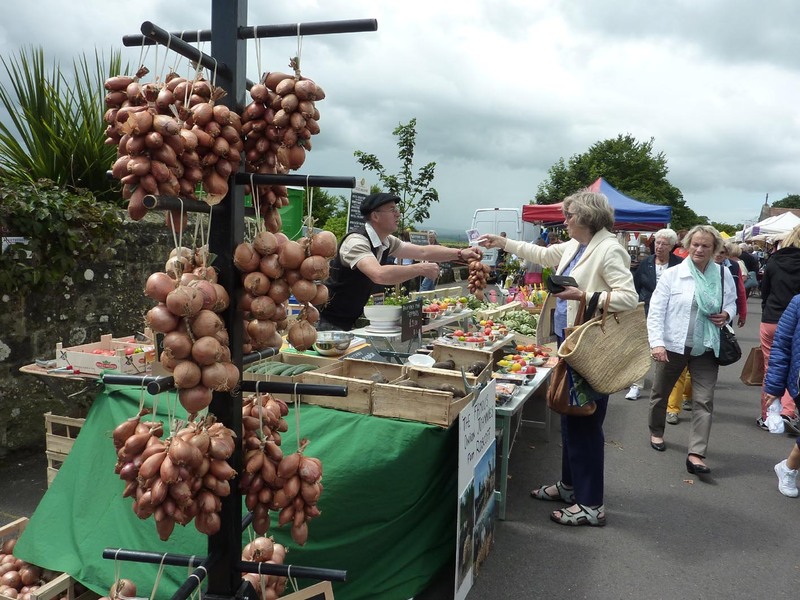 Part of the Gold Hill Fair was a French (Boo!) Market on Park Walk, so we bought some french tarts and sat on a bench, contemplating the route of our morning’s walk. What to do now? 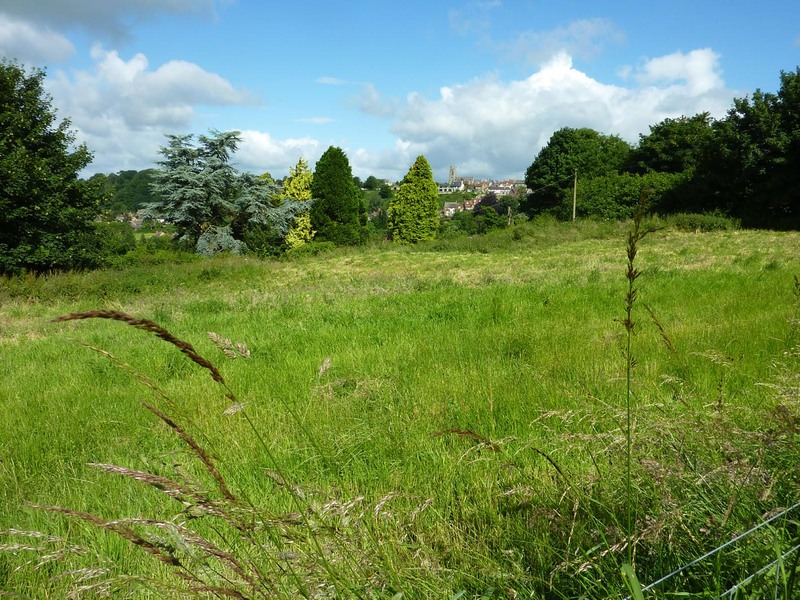 Visit the Abbey museum and garden (just behind us) or travel further afield. From Castle Hill we had spotted King Alfred’s Tower. 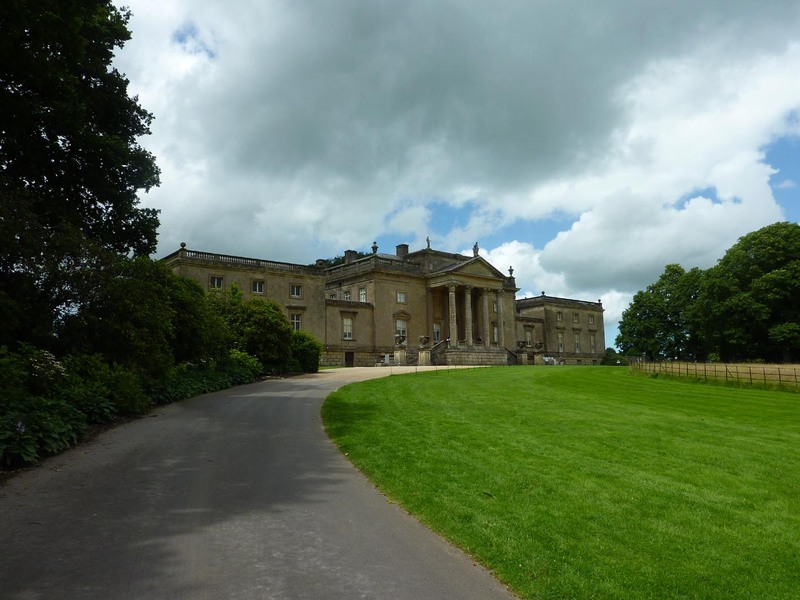 The weather seemed set fair so we returned to the hotel to collect the car and headed for Stourhead. Being members of the National Trust, we had to take advantage of free entry. Clouds had gathered so we decided to go round the house first, luckily we missed a short downpour and by the time we emerged the sun had returned and we walked round the grounds – perhaps not a good idea after all the walking that morning. An ice cream was very welcome. 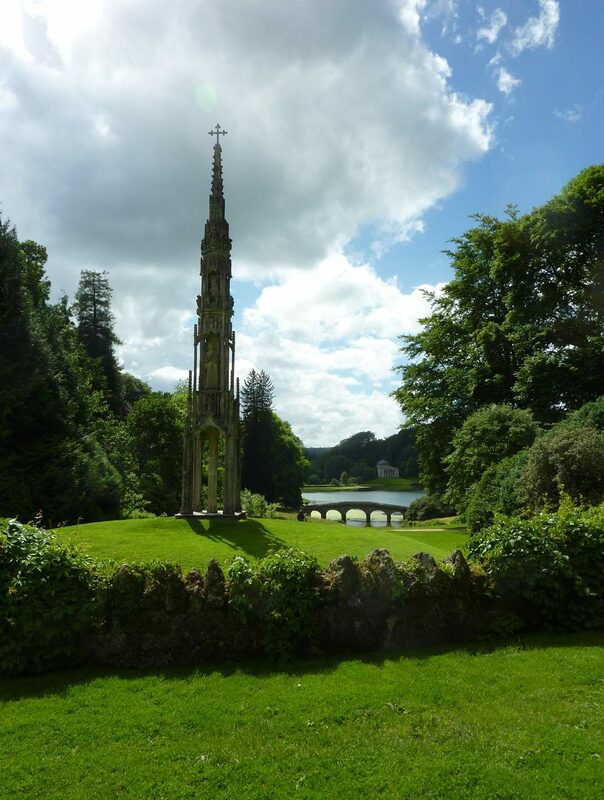 King Alfred’s Tower is on the Stourhead estate and I think you can walk there, but we had had enough walking that day. It seemed a long way even in the car! We reached the car park about 4.15 and we were told that the tower had closed at 4.00. Oh dear, we wouldn’t be able to climb up the 205 steps to see the view from the top. 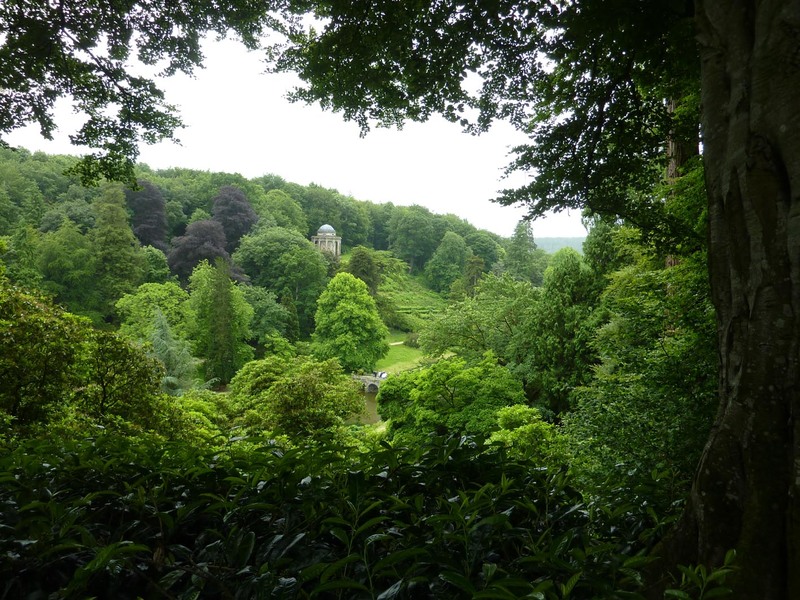 The tower is surrounded by trees, so there is no view of anything at ground level but it is situated in a meadow studded with wildflowers, including orchids – common spotted, I think. Of course the Tower was not built by King Alfred. 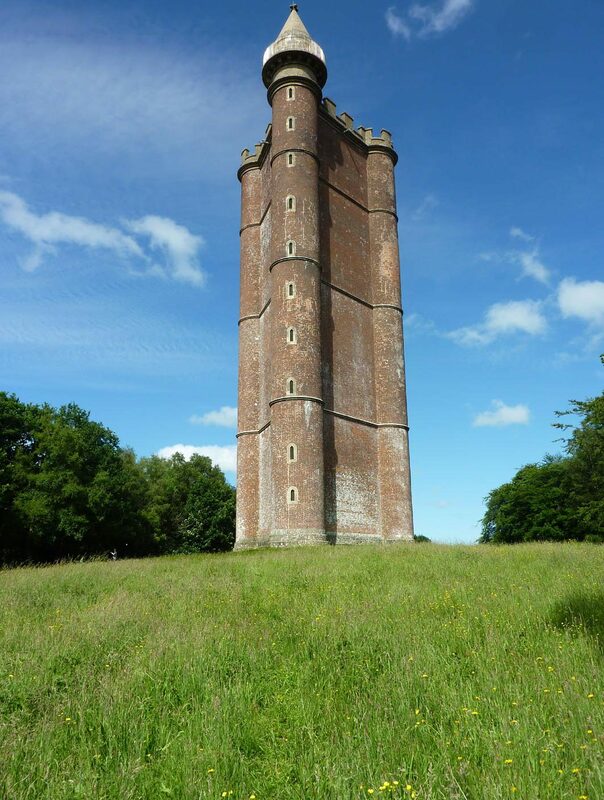 Like the rest of the estate, built by the Hoare family, over 250 years ago, it is a folly, completed in 1772 at an estimated cost between £5,000 and £6,000. However, it is supposed to be the site of “Egbert’s Stone” where King Alfred rallied the Saxons in AD878 before the Battle against the Danish army of Guthrum at the Battle of Ethandun. Which we were to witness the next day! ← The First Step – or is it the Second?